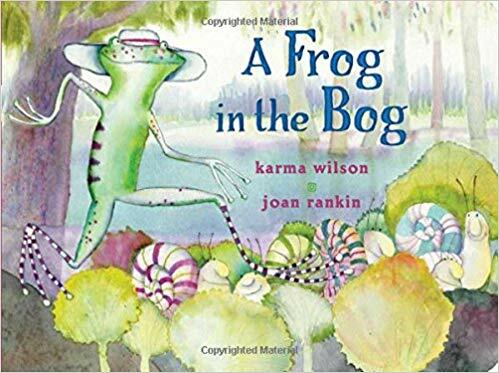 One of the books she read to the Kindergarten class yesterday was A Frog in the Bog by Karma Wilson, illustrated by Joan Rankin. Karma Wilson is the author of Bear Snores On – we have every single one of those books, they are still very loved in this house! A Frog in the Bog is a simple counting story with rhyming prose. It is a pleasure to read aloud with a great surprise! The illustrations are colorful and perfect. My kids always asked for this book when they were little, and they would giggle their way through it and laugh at the surprise. I have such wonderful memories of reading this book with them. I hope you are planning on reading with your kids this weekend. Go check out your local library for A Frog in the Bog, and if you haven’t read any of the Bear Snores On books, I highly recommend them. Thank you, Karma Wilson. Be sure to check out www.karmawilson.com. There is a complete list of her books, a section just for kids, as well as one for teachers, which includes lesson ideas for the classroom.